A Playbooks® Readers Theater Story to read out-loud for two or more readers. For children in grades 1st – 3rd Grade. 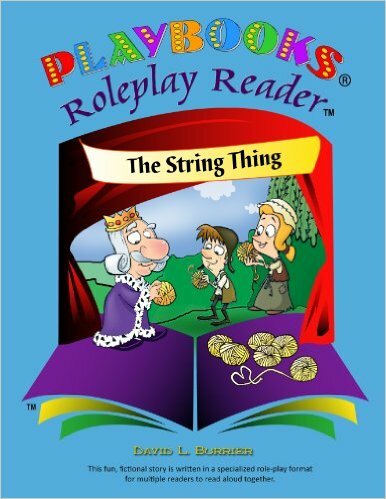 Includes character roles written at Playbooks Reading Stages 1-3. The old adage “to spin a yarn” means “to tell a tale.” Well, if yarn can tell a story, wait until you read what string can do! In this delightful and lively story, the adults of the village, both royal and common, with their single-minded thinking, can’t seem to accomplish the rescue of someone who’s fallen down a deep, dark hole. Thanks to a wise king and a special gift he gives to every child in the kingdom, and to one child who steps forward in courage, a profound idea is born. You may well ask, “How can a story about string become a legend?” See how a simple ball of string became a symbol of the power of cooperation and collaboration for an entire kingdom. Sign up to receive my email announcements.